Designed to be buried up to thirty-six (36) inches under ground, the material structuring of this fiberglass underground storage tank gives it the tools necessary to survive storage in underground conditions. Additionally, fiberglass is a strong material that has a high resistance to denting, contracting, splitting, rusting, corrosion and more. 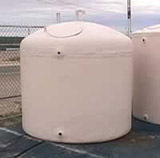 Whether you need a safe place to store your drinking water for emergency situations or a place to store industrial chemicals, this is the right fiberglass underground storage tank for you! Standard construction of this tank allows you to bury it up to 36 inches (or three feet). If you will need to be burying this tank deeper than three feet or if you need a tank that is traffic-rated, please specify your requirements so your tank can be adjusted to safely meet your needs.